This is the first edition of a widely reprinted captivity story. The volume is summarized as "Containing also an interesting account of the massacre of the Oatman family, by the Apache Indians, in 1851; the narrow escape of Lorenzo D. Oatman; the capture of Olive A. and Mary A. Oatman; the death by starvation of the latter; the five years suffering and captivity of Olive A. Oatman; also, her singular recapture in 1856; as given by Lorenzo D. and Olive A. Oatman, the only surviving members of the family, to the author." 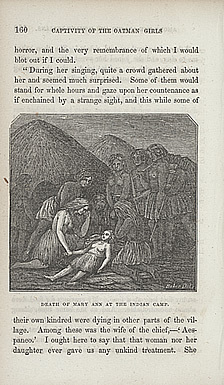 The page presented here is from the first edition, and shows Olive and her younger sister Mary, soon after their capture. Olive is pictured helping her weak and failing sister, as a group of captives surround the helpless girls. Captivity stories placed women and children in sympathetic roles, and the experience of the two Oatman girls, Mary and Olive, is one of the most circulated accounts of the day. The letter (left) is part of a group of letters collected by Capt. G.C. Smith for Hubert Howe Bancroft. 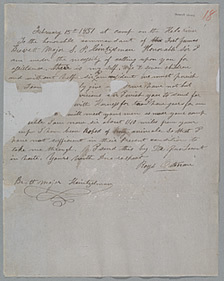 The letters contain material relating to the Indian attack on the Oatman family on the Yuma trail in February 1851, including this letter from Royal Oatman and reports of interrogation of survivors. This February 15, 1851 letter, possibly written only days before the attack, offers a haunting premonition of what was to befall Olive Oatman and her family. Olive Oatman was born in Layharp, Illinois is 1836. Captured by Indians at the age of fifteen in 1851, she survived her ordeal until freed in 1856. In November of that year she married John B. Fairchild. She moved to Rochester, New York; to Michigan; and ultimately to Sherman, Texas where she lived with an adopted daughter. Olive Oatman died there in March, 1903. In the 1860s Olive Oatman delivered public lectures on the westward trek of her family and the captivity experience she endured with her sister, Mary. The lecture notes reflect Olive's deep love for her late parents and departed sister, and describe the attack upon her family, "when suddenly these wilde savages with a fiendish yell & tigers bound fell upon us." The young woman's observations upon the physical and mental cruelties at the hands of her captors, and the hardships, which ultimately claimed the life of her younger sister, are presented in dramatic fashion. Olive referred to her captives as " . . . filthy, lazy & ignorant. The men especially, were indolent & only when stern necessity drove them to it would they seek food." Mary often yearned to join that better "world" where "Father and Mother" had gone. The lecture, as the book, concludes with descriptions of her heroic rescue achieved after a 250-mile walk and "amid the shouts & cheers of the soldiers, the 22nd day of February 1856. Five years & seven months from time we lef Misouri (sic)." The Reverend Royal B. Stratton interviewed Olive Oatman and her brother Lorenzo within a few months of the young woman's return from Indian captivity. The preface to the first edition, published in 1856, includes Stratton's explanation that he was engaged by the Oatman's to write their account, based upon the facts provided. In 1857, the preface to the second edition includes Stratton's notation that the sale of all 5,000 copies of the first edition prompted the 6,000 volume second edition, embellished with facts on Indian customs and the geography of the region. Stratton apologies for his "puffed" prose and informs the reader that the profits from the sale are to provide Olive and Lorenzo with money for their education. This comment aside, one wonders if Stratton worked without remuneration. The Oatman siblings did attend school in Santa Clara Valley, California for a few months, but they traveled to New York with Stratton to produce yet another edition of the work, this one enhanced with an image of Olive bearing a facial tattoo applied by her captors. The second edition was reprinted in 1875, the year of Stratton's death. In 1909 an abridged edition appeared in Salem, Oregon, some six years after Olive's death. John Henry Nash and the Grabhorn Press produced a reprint of the first edition in 1935, and this epic tale continues to appear in scholarly and historical works on the topic of Indian captivity narratives. The second edition (1857), and later printings bear the title, Captivity of the Oatman Girls.